Belgium beat World Cup favourites Brazil 2-1 on Friday to set up a semifinal against France in Saint Petersburg. A Fernandinho own goal in the 13th minute followed by a superb Kevin De Bruyne strike just after the half-hour put Belgium in the driving seat. Brazil pulled a goal back through Renato Augusto but it was too little, too late. Neymar had a late chance to equalise but Thibaut Courtois tipped over as Belgium clung on. 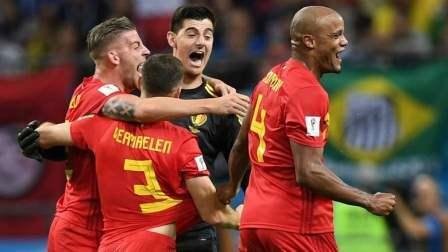 Belgium coach Roberto Martinez said his side "deserve to be heroes" back home after downing five-time champions Brazil. "They did incredible. There were amazing hearts out there. I didn't think for one minute their hearts would give way," said Martinez. "You have to accept that Brazil have so much quality and finesse, they break you down, but we did not accept it. Not for one minute were they (Belgium) going to give up. "These boys deserve to be heroes in Belgium. The execution of the tactics was magnificent. "It is special and we can't let the people of Belgium down. We can pass that down the generations - beating Brazil." Earlier, France beat Uruguay 2-0 in the first quarterfinal on Friday. Raphael Varane's glancing header and a goalkeeping blunder that gifted Antoine Griezmann a soft goal gave France the win.